On the same day Tom Clancy died, Paramount Pictures released the first poster for Jack Ryan: Shadow Recruit, their big reboot of the Jack Ryan film franchise. One day later they released the first trailer, meaning in a 48-hour span we learned that Clancy had died at the age of 66 but has attained immortality in that his most notable artistic creation, Jack Ryan, lives on. Let’s try to see the timing of all this as a positive thing as opposed to truly crass marketing on Paramount’s part, a tribute rather than exploitation (or honest-to-goodness unintended coincidence). Shadow Recruit aims to function as a new Jack Ryan origin story, and this time it’s not based on a Jack Ryan novel but instead an original screenplay idea. That’s certainly curious decision considering there are 4 Jack Ryan novels yet to be adapted into movies (although after 9-11, the climax of Debt of Honor makes it unfilmable for the foreseeable future), and even five novels centered around Jack Ryan’s son. However, Shadow Recruit actually looks like a perfectly enjoyable spy thriller. 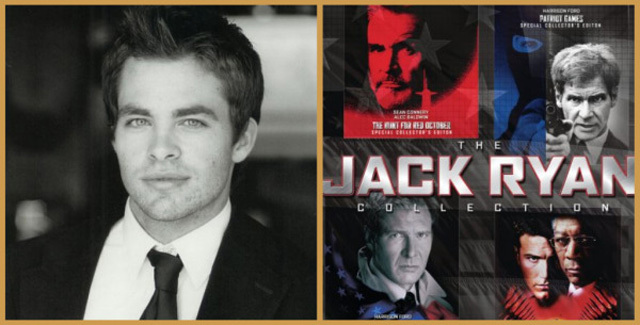 Chris Pine is now the fourth person to play Ryan, following Alec Baldwin (Hunt for Red October), Harrison Ford (Patriot Games, Clear and Present Danger) and Ben Affleck (Sum of All Fears). For that matter, Keira Knightley is the third actress to play Jack’s wife Cathy, after Anne Archer (Patriot Games, Clear and Present Danger) and Bridget Moynahan (Sum of All Fears). Pine might be harder to believe as a CIA analyst than he is as an action hero, and the whole keeping his secret agent life from his spouse is a trick he proved incredibly inept at pulling off convincingly in This Means War. As for Knightley, the trailer heavily hints there might be more to this version of Cathy Ryan than prior interpretations. However, raise your hand if you had no idea this film was actually being made. Is your hand raised? I clearly have no way of knowing. It’s not like we’re chatting on Skype. Screw it, my hand is sure raised. Somehow, Shadow Recruit snuck on me. It’s the type of movie Hollywood has been trying to make for a decade now. After Sum of All Fears grossed the modern-day equivalent of $167m domestic, there was going to be a straight sequel again starring Ben Affleck. However, then the world decided to collectively start hating Ben Affleck, and after Reindeer Games, Surviving Christmas, Gigli, Paycheck, and Jersey Girl could you really blame us? Sam Raimi quit as director as did his replacement, Jack Bender. The screenplay went through five different writers, and the only one of them (Steve Zaillian) with any prior experience with the Jack Ryan films (he wrote Clear and Present Danger) quit after only a couple of weeks. At some point, somewhat quietly, this thing finally got made, directed by Kenneth Branagh who also double times as the Russian (?) villain. The trailer highlights a Bourne Identity-esque fight scene at the beginning followed by lots of standard spy-thriller tropes, i.e., the villain with a heavy accent (Branagh, and general air of distrust). Kevin Costner is around as the badass CIA agent who recruits Jack , and the word is Costner’s contract calls for him to play the same role and fill the same function for a planned companion film, Without Remorse, centered around Clancy’s other big character, Jack Clark. From the looks of the trailer, Costner may yet prove to be the best part of Shadow Recruit. So, him making a return appearance in Without Remorse is an enticing proposition. UPDATE: Paramount blinked in the face of the overcrowded Christmas period, shifting Shadow Recruit from its original release date of December 25, 2013, to January 17, 2014. Unfortunately, Shadow Recruit trailers playing in theaters still advertise its release date as December 25, 2013. What do you think? Does it look like a spy thriller worth seeing? Just hope Chris Pine is at least marginally more convincing a Harrison Ford-replacement than Ben Affleck? Let us know in the comments.